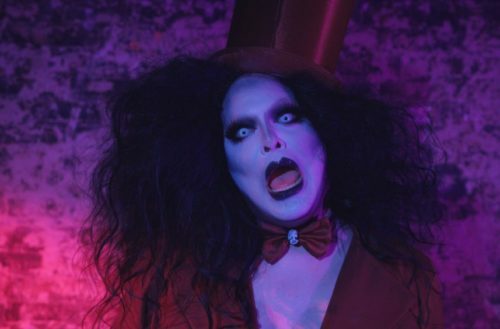 Drag artist Pissi Myles just dropped the hauntingly funny music video for “Babashook,” her newest dance track inspired by the queer community’s latest creep queen: The Babadook. If you’re still wondering what all this Babadook stuff is about, here’s the backstory. A Netflix bug mistakenly placed Jennifer Kent’s modern horror classic The Babadook in its LGBT Movies section. And since this is the internet, the meme machine took off — making the film’s monster into a queer icon. Recently featured as a special guest on RuPaul’s podcast, “What’s The Tee?”, Myles performs in New York City, Philadelphia and all over her home state of New Jersey. She is also a staple in Asbury Park, the gay beach enclave on the Jersey Shore. Myles has dedicated her career to representing the freak in all of us. “I think queer people have always identified with the isolation and power of the monster or villain in a horror movie, especially when they’re as fabulous as Babadook or Ursula the Sea Witch,” she says in a statement. “Babashook” was co-written by Myles and humorist Topher Cusumano, with an original track by producer B. Ames. The video was directed by Joe la Scola with drag photographer David Ayllon serving as creative director. We’re fans of the video and fans of Myles’ work in general. She’s obviously on Mamma Ru’s radar too, so who knows? Maybe we’ll see her on season 10 of Drag Race! You can buy “Babashook” on iTunes here.